This is a deceptive book. It would be easy to mistake its self-deprecating, sometimes prickly, tones as the work of someone at ease in the margins, comfortable in a cultural edgeland, the prose of an eccentric. But this is a far bigger and more exemplary fable than that – here a wanderer, repeatedly interrupted by ordinariness, journeys to contain in words and sweat a “vast and yet seemingly invisible presence” that “hovers over the northern suburbs of London”. The mixture of desultory adventure, hallucinatory encounter and close attention to detail and junction irreversibly transforms whatever it was we may have thought ‘mundane’ to be. The journey does not begin in intellect. There is no light bulb turned on by Debord or Long. The journey starts among plastic Daleks in difficult, unsympathetic dadland; not as the opening of a pilgrimage of escape into excess, but a loss of one temper in order to find another, just the sufficient openness in a closed world to respond to the strange attraction of an alley. From then on Nick Papadimitriou will be “always alone”. There is nothing exhibitionist or noble in his solitude; it is the requirement of a body that can “become the stratum of gravels surfacing on a hill track after heavy rain” while locating itself in a landscape without an otherwise interesting ambition. Scarp sails close to cliché. The story of how experiences would lead Papadimitriou from stage sets ready for “little dramas designed to fit within the lounge, the coffee shop and the bedroom” to “something larger and older” could easily become a self-satisfied or transcendental one in other hands. 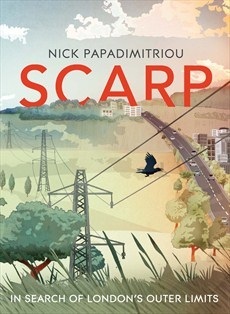 But the motor that winds Papadimitriou’s prose so tightly in Scarp is not contempt for suburbia but rather their jilting of the author who never was invited “to meet once again with those arched eyebrows and the togetherness over fondue and Mateus Rosé”. There is nothing cleverclever here; the loss is real, an uncomfortable gift that allows Papadimitriou into a hypernatural (rather than supernatural) world of un-ageing spirit-tramps and ghosts of dismembered cars. Curling inside his looping journeys across the North Middlesex/South Hertfordshire escarpment, on which Papadimitriou de-romanticises ruins and tweaks the erogenous zones of gold courses, are other narratives that bend like tiny dimensions inside the bigger shell. A firestarting episode triggers a journey through another London of cells and prison vans; twisting his motor even tighter. But nothing quite explains the damaged mythic figures that step sure-footedly inside and around his own wanders: Gloria Geddes, a disappointed goddess, magic mushrooms for Mateus Rosé, contemplating the railways tracks, terminally jilted, through whose eyes the writer encounters himself as “a scruffy-looking man... muttering about something he called his county consciousness”. Nick Papadimitriou has called his wandering and watching and logging “deep topography”, but terms are of limited use; there is much more here than a label can contain and much less that divides it from other walkings. What he has written here is one of the best books on ‘other walking’ we are ever likely to read – it is up there with greats like Careri’s Walkscapes, Shehada’s Palestinian Walks, Stilgoe’s Outside Lies Magic, Whitehead’s Walking To Work and Graham’s The Gentle Art of Tramping. It fulfils, and more, all the rumbling promises of recent articles and John Rogers’s films of Papadimitriou’s walking. A Temple of Winds blown down, the Blockbusters HQ, working “tile-by-tile” across a cell floor, a London Underground carriage on bricks in a field, slowworm universes, a found diary of delusion, The Enemy, cunning folk, Midsummer Men – they are waiting at the end of “the alley two houses down” where Papadimitriou first hears the voices emerging from “deep beneath our front gardens, our ornate wrought-iron gates and tarpaulined Morris Minors”. The writer makes it very clear that he does not need to walk with us, he prefers to map alone, but his Scarp is otherwise; a massive generosity, an invitation to other alleys.